Hi there. 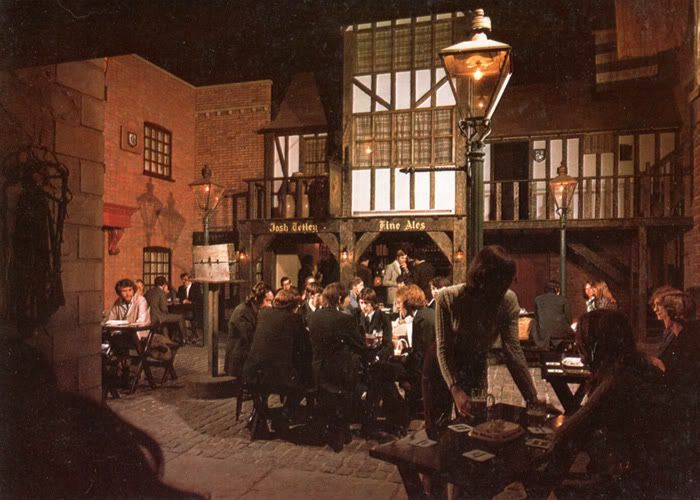 Here's a 1970's picture of the Courtyard in the Stonehouse. That brings back a few drunken memories! Brilliant! What is the story behind this - how did it come to exist? Maybe it should be recreated somewhere as part of the new redeveloped Sheffield, along with other lost gems and follies. I remember going in there for the first time in the late 80's and thought i'd gone back out side. I remember the lasers in there. I`d never seen lasers before and when that white smoke stuff came out of the walls and the lasers started firing off... Excellent stuff! That was about 1980 if I remember rightly. I remember there being a long crack in the paintwork all along the starry night sky ceiling, sort of ruined the effect a bit. brill pic brought back memories of fri/sat nights we used to meet up before going on town. most guys were in suits like pic, but did not realise how bad our hair was, mum was right. early 70s. You mean.. it wasnt outside? It was all a facade and was located where Waterstone's is now in Orchard Square. You could get in at the back of the Stonehouse by going down a road which was approx next to where Museum is (off the road where the bookies is). There was also a hairdressers just inside the entrance which is next to the bearded bloke in white on the left. Disappointingly, it was just a store room upstairs for crisps & glasses etc. thanks so much for posting the picture. It was a great place to go in those days and brought back some very happy memories. And after a few drinks, who cared about the line on the ceiling anyway? Did guys have to wear a jacket & tie to get in clubs back then?